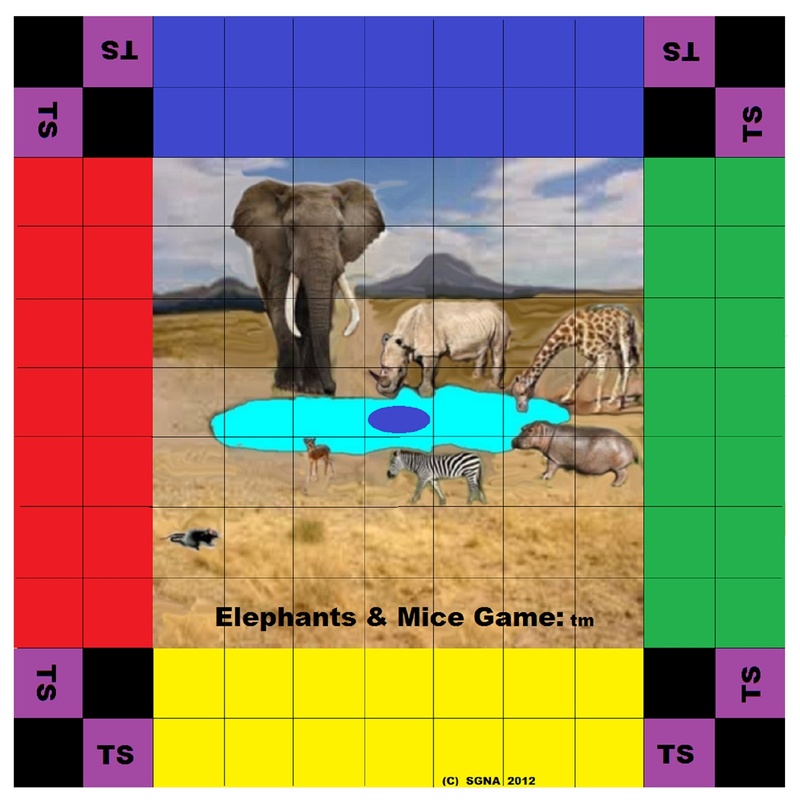 Elephants and Mice Game is played by 2 to 4 people. 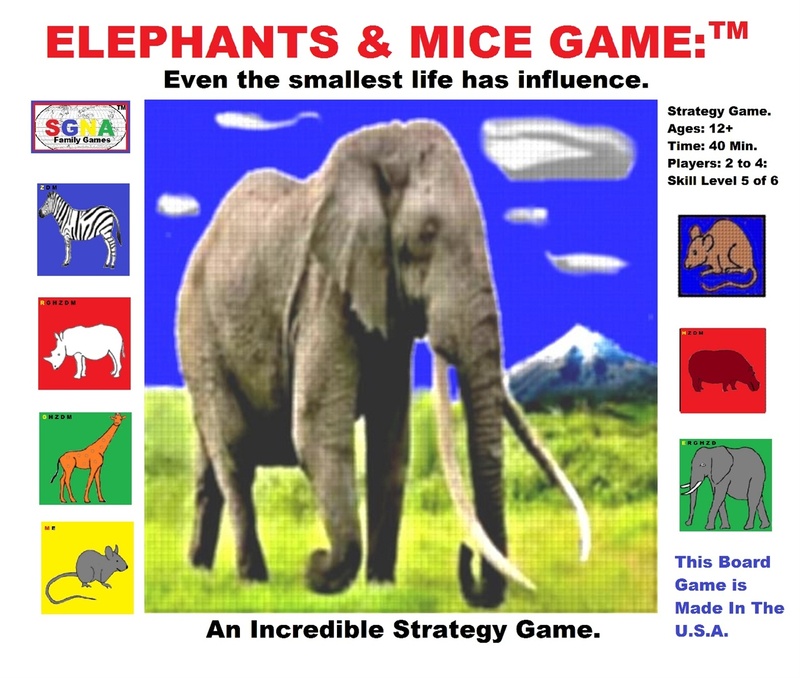 Ages to play Elephants and Mice Game are 12 to adult. Play time for Elephants and Mice Game is 30 to 45 minutes. 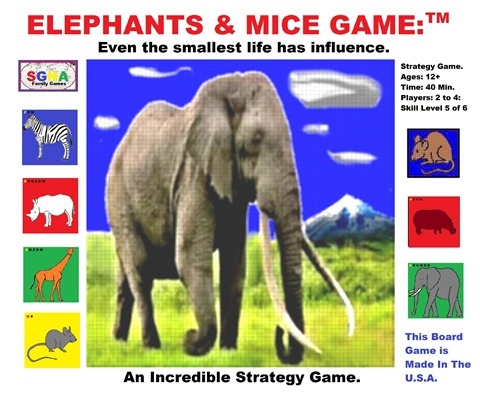 Elephants and Mice Game is a strategy board game. The objective of the game is to land on the center square [The center of the animal watering hole.] with an animal token and keep control of it. When the other players concede that they cannot take the watering hole away from you, then you have won the game. Each player is given a different color of animal token group. The player looks at a token (without letting the other players see which animal it is) and then places it on any square in the first two rows, of his color group consisting of 7 squares each. Red tokens on red squares, blue tokens on blue squares, etc. Each token is placed with the animal side down. The player should try and remember where he/she placed the different animal tokens, but if they need to peek at their tokens on the board from time to time this is acceptable during game play. When you are peeking don’t let the other players see what your tokens are. Each player has the ability to move his/her tokens up to 3 squares diagonally or up to 4 squares horizontally and/or vertically, or a combination of both, horizontal and vertical as long as the total squares moved is not more than 4. A player may not make an attack move during the first move of the game. During a player’s turn, if a player feels that their token is of a higher status than one of their opponent’s tokens, and it is within range for an attack, they may move their token and land on their opponent’s token, with the intent of removing it from game play; but when an attack is made, both players must turn the tokens over so all the players can see the type of animal that is on each token. The weaker token is removed from the game board and the stronger token remains on the attacked space and is then turned face down to continue game play; now all players know what animal status that token is. If two animals are the same status during an attract, both animals return to their original squares. It is then the next players turn. A players tokens can not hand or travel through the 8 black corner squares. A players tokens can be attacked any where on the playing board, including the players own colored start squares. Each player has 2 Transforming Squares [TS] on their side of the board, on their first row of squares. Twice in the game, a player can move one of his tokens on to one of the Transforming Squares. The player can then replace this token with one of their tokens that have been removed from game play, placed face/animal down. This would be considered a move and play would go to the next player. Tokens that are removed from the game are placed off to the side in separate piles, face down. A player may look at the type of animal token they have in their pile at any time, but the opponent players may not. The first player to land on and control the watering hole [ center square], by following the rules, without challenge from other players WINS the game.